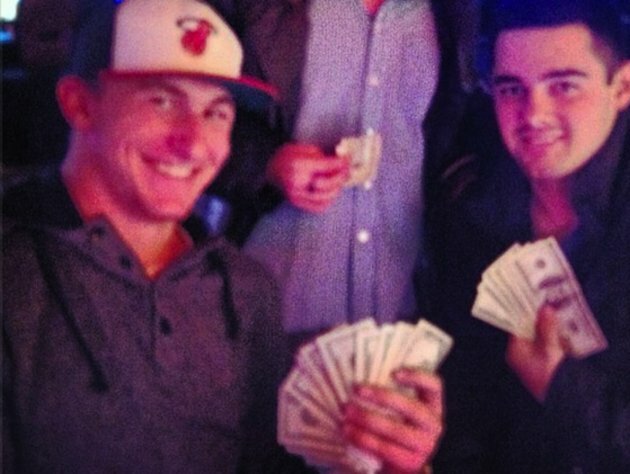 Pictured above Johnny Manziel (Johnny Footbal) with lots of cash. Ephesians 2:8 has always been one of my favorite verses; “For by grace you have been saved through faith. And this is not your own doing; it is the gift of God…” ESV. My good friend, Jordan Farris, got me Francis Chan’s latest book, Multiply, for Christmas. I started to take time out of my day to read it, and go along with the devotionals in it. One of the first devotionals is titled; The Lord of Grace. A part of that section that really stuck out to me and really resonated with me was a sentence that said: “No one can brag about his or her good deeds, because our works cannot save us.” As a person that struggles with arrogance, and boasting I can tell you, this hit me deep. “Our works CAN NOT save us.” Thats huge. Sometimes we are so proud of what we’ve done, we get lost in ourselves, which brings me to the aforementioned picture above. Its easy to be stuck on oneself, especially when you’ve worked hard to be where you are. “Johnny Football” Concluded his Heisman Red-Shirt freshmen season last friday with a 41-13 shellacking of my Oklahoma Sooners. It was a hard fought game for the first half, but Texas A&M really pulled away in the 3rd and 4th quarters. Johnny is known to be a firey guy both on and off the field. I also believe he is a man of God, but I haven’t heard for sure. He deleted this picture shortly after posting it, and I think that’s for one reason. He knows its wrong to brag or boast on ones deeds. In order for God to be the Lord, or Master, of your life, you must through yourself into second. Your own deeds will not get you eternal life, only a personal relationship with God can do that. Another line that really stuck out to me in Multiply was an early chapter that says, “The thought that someone else has paid for our crimes is strange to most of us, because it defies our natural way of thinking.” Jesus paid the price for you, and I on that cross just over 2000 years ago, and he had us all in mind. Our debt was paid that day, and I think sometimes it’s hard for us to wrap our minds around that fact, but thats another post for another day.